This book took me completely by surprise – and in the very best way. This is an epic story, in the tradition of Lord of the Rings or The Shannara Chronicles or any other fantasy in which a group or band of characters sets about on a journey in which each of their special skills is needed to survive. But Dolkart, in this fabulous publishing debut, brings a number of unique aspects to the story, the first of which is that this group is thrown together unexpectedly – no one knowing anyone else at the start but needing to come to understand, respect, and ultimately rely on one another. The other is a setting that I’ve never quite seen before – a location that is intelligent and magical. Five people board a boat to leave their homeland, for varying reasons. Shortly thereafter heir homeland is completely destroyed by a vicious plague which stinks of magic. The group of travelers are now on their own to make a life for themselves, away from everything they new and everything that comforted them. The new land that they are in is full of magic and the encounter a wizard, Psander, who will do everything in his power to protect the secret of his invisible fortress. The five refugees become wards to Psander and set out to free a captive dragon and unleash an ancient monster. This book is exciting, from start to finish and the characters are extremely well-defined, each with traits that make them both likable and sometimes despicable. Bandu, the wild girl was probably my favorite because, like the animals she walks with, she is loyal to what seems right and her loyalty is unconditional. I also liked Criton quite abit, but perhaps for his potential more than for anything we see directly in the book. His story, moving forward, is one I am very interested in, whereas Bandu’s past intrigues me more. The princess Phaedra is the least well-defined for me. She serves her purpose early in the book by keeping the band together, and later in the book by … well, I don’t want to give too much away. I really liked going in to this book not having a clue as to what it was going to be about or what sort of adventure we would be on, and I found myself often thinking, “Damn! That’s really good!” The characters were a very different batch of people from what you might typically find in a fantasy book, and their journey was interesting and fraught with exciting danger. One of the things you might look for in a fantasy novel of this sort is the world-building and Dolkart does a prety good job filling his world with an interesting array of geography and plant and animal life. Occasionally Dolkart gets caught up in the cool things but forgets the path of the book and we maybe spend a little too much time with some of the minutiae (mushrooms, ants, and a near-death fall) that doesn’t really seem to go anywhere. Still, this fantasy, and these characters really caught my attention and I look forward to reading more about Silent Hall and the people there. Looking for a good book? 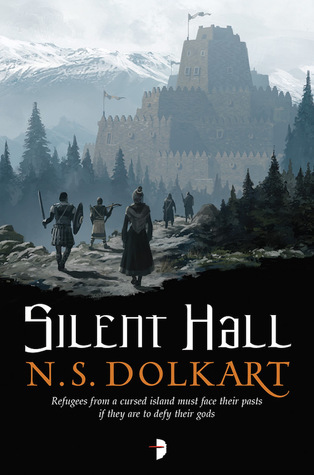 N. S. Dolkart’s debut novel, Silent Hall, is an epic fantasy adventure that explores new ground with a reluctant band of adventurers and really captures the reader’s attention.